When it comes to thinking up themes for new video slots, it's fair to say that the world of ancient Egypt is up there for most popular. With pyramid-themed slot, Book of Ra, from Novomatic, still pulling in the punters years after they came out, it's no wonder Scandinavian slot developer NetEnt are so keen to get in on the act. 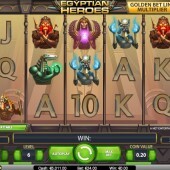 Net Ent's own contribution to the cause, the 5-reel, 20-payline Egyptian Heroes, mines similar territory to the slots I mentioned above, and all the requisite bonuses are present and correct here: free spins, Wilds, and a new feature called the Golden Bet Line. How does that work? Well, before each spin, one of the lines turns golden, carrying a random multiplier from 2x to 5x. Hit a winning combo across that line and you'll be bagging the big bucks. That's not all. There are free spins - 10 to 20 of them - won by hitting three or more Scattered Tomb symbols across the reels. During the free spins, a Wild symbol occupies the entire middle reel, allowing for many lucrative wins. In addition, when they can complete winning bet lines, Wilds will expand on Reels 2 and 4 too. The free spins can be re-triggered too so it really pays to make them work for you. Meanwhile, there are regular Wilds that play out in the base game. These are represented by the Pyramid, expands on reels 2, 3 and 4, and substitutes for all symbols except the Scatter. Although the theme and imagery is nothing new in this slot, Net Ent do everything in a slick, polished manner. 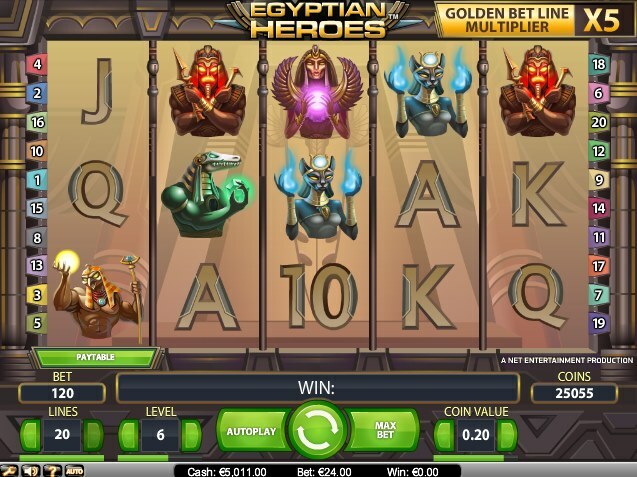 You've seen the symbols before - Egyptian gods like Amon Ra and Osiris, tombs, ankhs and gold birds - but the addition of different Wilds, free spins and a neat new feature in the Golden Bet line should ensure this slot joins the pantheon of popular Egyptian-themed slots for some time to come.